Abstract. Chemical analyses of pigments in skin, scales, feathers and fur have provided deep insight into the colouration and visual communication strategies of animals. Carotenoid pigments in particular can be important colour signals in birds and other animals. Chromatographic analyses of plumage carotenoids require the destruction of one or more feathers, which has made pigment research on threatened species or museum specimens challenging. Here we show that Raman spectroscopy, coupled with multivariate statistics, can be used to identify the most abundant carotenoid within a single feather barb without sample destruction. Raman spectra from the feathers of 36 avian species were compared to data on pigment presence from high-performance liquid chromatography. Feathers rich with a-doradexanthin, astaxanthin, canary xanthophylls, canthaxanthin, cotingin or lutein were discriminated by subtle shifts in Raman spectral band positions, and by novel bands associated with particular carotenoids. As an example application of this method, we predicted the most abundant carotenoid in the plumage of selected Australian and New Zealand songbirds. a-Doradexanthin is predicted in the plumage of Petroica robins from Australia, whereas Petroica immigrants to New Zealand display a yellow carotenoid that is likely lutein. Raman spectroscopy is useful for non-destructive studies of carotenoids and is well-suited for analysing large ornithological museum collections. 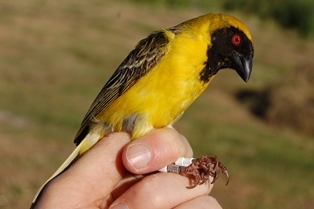 Weavers were not the main focus in this paper, but the Southern Masked Weaver (with many other species) was analysed for carotenoids using high performance liquid chromatography and Raman spectroscopy. 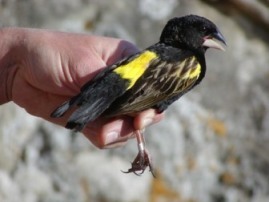 One feather from seven additional species was studied with Raman spectroscopy, including Yellow Bishop and Dark-backed Weaver. 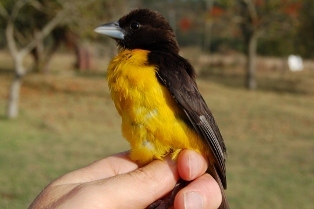 The major carotenoid was lutein in all 3 weavers while the Southern Masked Weaver sample also had some zeaxanthin. Lutein (meaning "yellow") is a xanthophyll and one of 600 known naturally occurring carotenoids. Lutein is synthesized only by plants and like other xanthophylls is found in high quantities in green leafy vegetables. Lutein is obtained by animals directly or indirectly, from plants.